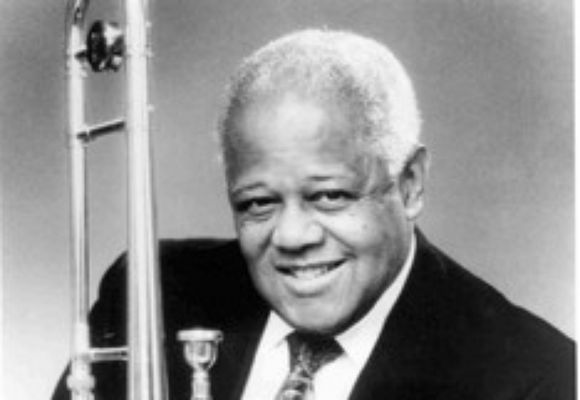 Slide Hampton & Jonathan Voltzok " Jay & Kai Tribute"
Slide Hampton & Jonathan Voltzok "Jay & Kai Tribute"
Locksley Wellington "Slide" Hampton (born April 21, 1932 in Jeannette, Pennsylvania) is an American jazz trombonist, composer and arranger. He was a 1998 Grammy Award winner for "Best Jazz Arrangement Accompanying Vocalist(s)", as arranger for "Cotton Tail" performed by Dee Dee Bridgewater. He was also a Grammy nominee in 2005 for "Best Large Jazz Ensemble Album," The Way: Music of Slide Hampton, The Vanguard Jazz Orchestra, and received another nomination in 2006 for his arrangement of "Stardust" for the Dizzy Gillespie All-Star Big Band featuring Roberta Gambarini. In 2005, the National Endowment for the Arts honored Slide Hampton with its highest honor in jazz, the NEA Jazz Masters Award. A masterly arranger and gifted trombone player, Hampton's career is among the most distinguished in jazz. written by Lucky Hampton. The group recorded on the King and Aladdin labels, but disbanded after having appeared at Carnegie Hall, the Apollo Theater, and the Savoy Ballroom in New York City. In the 1950s, his sisters Virtue, Aletra, and Carmalita formed the Hampton Sisters after Dawn went to New York and became an established cabaret singer and songwriter. The Hampton Sisters, performing for over 75 years! In 2005 Slide Hampton was honored at jazz fest in Indianapolis. There the Indianapolis Jazz Foundation inducted him into their Hall of Fame. 2007 Post-production documentary: Maynard Ferguson: The Unforgettable Real Story (2007), Hampton will play himself. Hampton is a resident of East Orange, New Jersey. He is the uncle of Chicago jazz trumpeter Pharez Whitted. Hampton suffered a mild stroke in June 2008. Despite the stroke, Slide Hampton continues to perform on his trombone. Just a few days after the stroke, he played in Kilburn Hall at the Eastman School of Music for the Rochester International Jazz Festival.